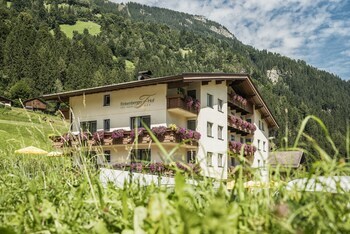 With a stay at Hotel Finkenbergerhof in Finkenberg, you'll be near ski lifts, just steps from Gletscherwelt Zillertal 3000 and a 1-minute drive from Finkenberger Alm I Cable Car. Featured amenities include complimentary newspapers in the lobby, multilingual staff, and a safe deposit box at the front desk. Free self parking is available onsite. Located in Vienna (Landstrasse), this apartment is within a 10-minute drive of Hundertwasser House Vienna and Wiener Prater.